Public Health England’s (PHE) digital weight management programme explores the role digital could play in a family’s healthier weight journey. 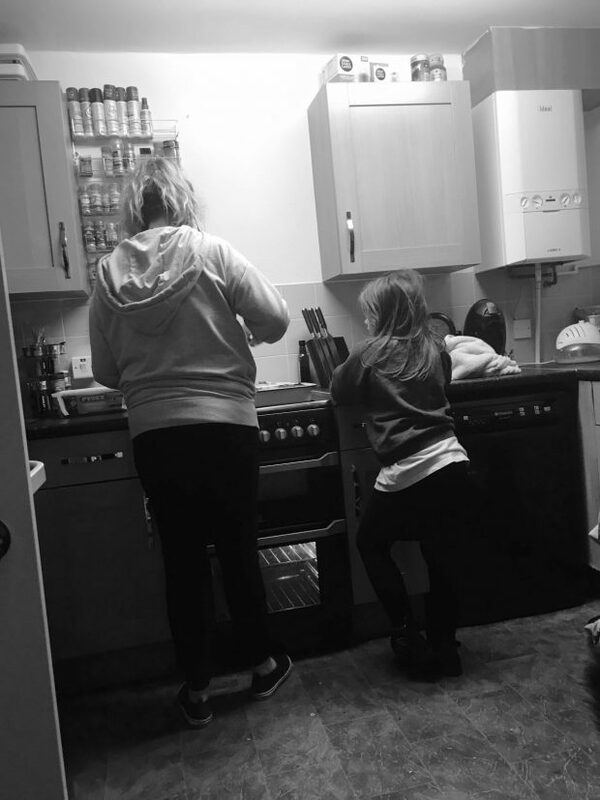 There are an increasing number of children with excess weight across England, with over a third of children leaving primary school above a healthy weight. The government recognises that childhood obesity is a systemic challenge, and that broad and varied responses are needed to change behaviours and build capabilities to tackle it. There’s also variation across the country in the local provision of weight management services for children and families. Where services are provided, there’s a lack of published data on their quality and effectiveness. What’s more, services often suffer from poor uptake and engagement due to barriers of access, cost, time and stigmatisation. PHE’s digital weight management discovery phase started with the hypothesis that there’s a gap in England for free and accessible weight management support, at a time and place that’s convenient for children and their families. This programme is the first of its kind at PHE, demonstrating PHE’s new way of working. It blends together service design with traditional approaches to public health, driven by a multidisciplinary team of service designers, user researchers and subject matter experts in obesity and behavioural insights. PHE and Uscreates completed the discovery phase between January and March 2018. We kicked off the project by thinking about the families we’d be designing for: Who are they? What do we know of their experiences? What challenges do they face? With the help of subject matter experts in the room, including family nurses from Southwark, we were able to focus our research and have an open conversation about the types of families we needed to find out more about. Our user research involved 10 families across England with children aged 5 to 9 who were above a healthy weight (7 daughters and 3 sons). Based on their occupation, the families were from social grades C1, C2 or D. Seven were white British families, while 3 were black and minority ethnic (BAME) families. Four of the families had previously engaged in, and completed, a face-to-face weight management service. We conducted ethnographic research with the children and their families, including in-depth interviews, observations and diaries. This gave us a level of knowledge deep enough to begin understanding the ‘why’ behind the ‘what’ of increasing childhood obesity rates. Our sampling mix wasn’t meant to be representative of the population of families with children above a healthy weight in England. Instead, it hoped to capture deep insights across a small but diverse group of families. These insights aim to inspire the design process and lead to further iterative research and testing with larger samples in later phases. 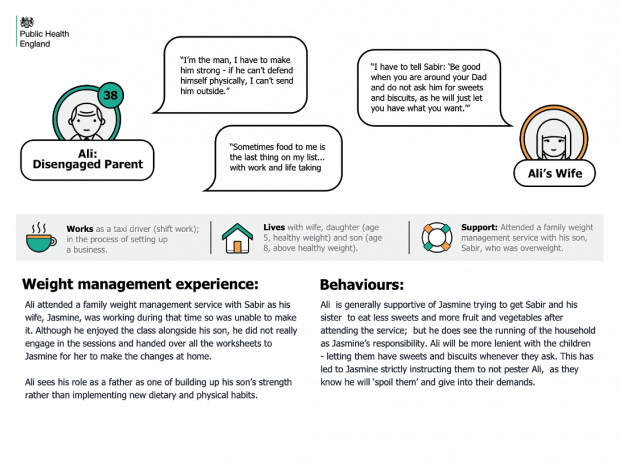 We then brought our users' insights together into a set of parent-and-child needs, mapped across their journey to managing their health and weight. We also identified 4 parent personas and 2 child personas with distinct characteristics. Below is an example of a parent persona created from our ethnographic research. It gives our team a rich picture of the parents’ life and experiences of managing their child’s health and weight. These personas will be vital to keeping families front of mind as we continue to shape the programme. Example persona of a disengaged parent produced during discovery. Persona segmentation (disengaged, fighter, thriver, survivor) based on the Healthy Foundations Life-stage Segmentation Report. We also saw first-hand the challenges of conducting user research with children, especially with parents nearby. For example, the parents would often speak on the child’s behalf. We’ll address this limitation in the alpha phase by planning more one-on-one, age-appropriate research activities with the children. For most families, their ultimate goal was to be a ‘healthy family’ rather than ‘manage weight’. When it came to understanding what being ‘healthy’ means, families placed a strong emphasis on eating and cooking as the primary way to maintain health. This discovery phase built on PHE’s understanding of children’s and families’ needs regarding weight management. It brought a fresh perspective by starting to explore if – and how – digital approaches could support a healthier weight behaviour-change journey. It also introduced non-digital staff at PHE to service design and new ways of working. Soon, PHE and Uscreates will move into an alpha phase, to build on our understanding of the users and their needs identified in discovery. We aim to identify what capabilities a product or service must have to meet those user needs. During the alpha phase, we’ll explore several concepts through further user research with families, with a particular focus on children – followed by rapid prototyping cycles, where we’ll build prototypes, test them, learn, change and test again! If you’d like to learn more about our research, or contribute to our understanding of the problem space, please email lisa.thompson@phe.gov.uk, Product Manager. Watch this space for further updates from the team as we move into the alpha phase of our project.